Forget discipline, training and mental fortitude. The greatest spur to sporting achievement is a deadly rival that you yearn to crush beneath the heel of your own glorious victory. That’s the philosophy that underlines Rush, an entertaining account of the fierce rivalry that flourished between James Hunt and Niki Lauda in the wild west years of Formula One in the 1970s. Oscar-winning director Ron Howard is often considered a safe pair of hands, bringing a diligent professionalism to mainstream, middle-brow projects. In Rush, he seems more engaged by material that echoes his frequent fascination with men testing themselves against their limits. It has an energy and commitment that makes for surprisingly absorbing viewing and a script by Peter Morgan that captures the complexities of both men rather than painting them as one-dimensional figures. You suspect Hunt would have heartily approved the choice of handsome hunk Chris Hemsworth to play him. Hemsworth does a fine job of capturing Hunt’s voice and his swashbuckling, devil-may-care approach to life. 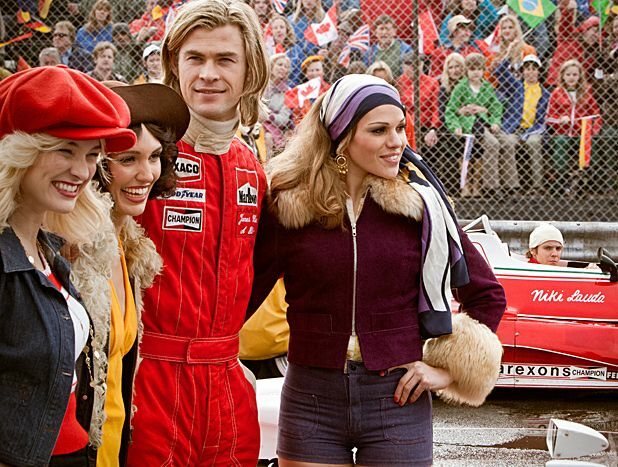 Daniel Bruhl is equally impressive as the ambitious, obsessively dedicated Lauda, a man whose only pleasure appears to have been in winning. They offer a striking study in extreme contrasts during the legendary Formula One season of 1976 when the prospect of death was a constant shadow on the racing circuit. The focus on the two men leaves the women in their lives as sketchily drawn bystanders, but once the film takes to the race track nothing matters except the roar of the engines and the bloody-minded determination of two very different but equally charismatic individuals. Even if you run a mile from Top Gear, this is still exciting stuff. General release from Fri 13 Sep.
Ron Howard's docudrama about the rivalry between James Hunt and Niki Lauda during the 1976 F1 season.